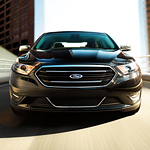 It is no surprise that the Ford Taurus continues to be one of America's bestselling vehicles. This popular full-size sedan is equipped with a host of premium design features that will impress even the most discerning drivers. The Taurus enthusiasts at Tracy Ford welcome the opportunity to invite you into our showroom so that we can demonstrate to you the beauty and practicality of these innovative design features. The stylish grille of the Taurus is just the start of its expertly crafted exterior design. The unique front end of the Taurus is complemented by the sedan's wide stance and clean sculpted lines. A host of innovative lighting features distinguish the Taurus from its competitors. All Taurus models come equipped with full LED taillamps. Not only are these lights bold and stylish, but they are also functional as they safely illuminate the road in front of you with bright incandescent bulbs.